Northern shrimp occur at depths up to 1380 m (4,526 ft). Northern shrimp are medium-sized shrimp with a rather slender body. They have a uniform pink color with no banding. The rostrum (a horn-like projection between the eyes) is 1.5 to 2 times longer than the carapace (hard plate covering the head and thorax). The third abdominal segment, at the bend in the abdomen, has a distinctive dorsal spine. There are also single spines on the rear margin of the third and fourth abdominal segments. In the Pacific Ocean, northern shrimp are also called pink shrimp, northern pink shrimp, Alaska pink shrimp, or spiny shrimp. Until recently, they were considered the same species as the pink shrimp, Pandalus borealis, found in the north Atlantic. The Pacific population was reclassified as P. eous in 1992. However, some taxonomists consider the Pacific population to be a subspecies, P. borealis eous. For this reason, the scientific name P. eous has not been unanimously adopted for the Pacific population. 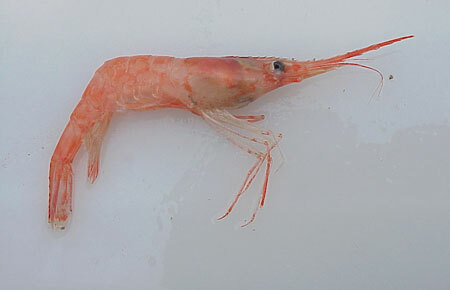 The most similar species to northern shrimp is the ocean shrimp, or ocean pink shrimp P. jordani. The ocean shrimp has similar coloration but can be distinguished from northern shrimp because it lacks the sharp dorsal spine on the third abdominal segment. Northern shrimp larvae hatch in the spring and swim throughout the water column for most of the first summer. They molt as they grow, shedding their outgrown external skeletons and growing new, larger ones. By the end of the summer, the larvae settle to the bottom and begin the juvenile phase. During the second summer, they molt again and become sexually mature, typically as males. After breeding at least one or two times as a male, they gradually transform permanently into females. The transition to female usually occurs in their fourth year of life and takes most of the summer. A very small proportion of northern shrimp start out as females and stay female throughout life. Northern shrimp breed in the fall, after the females molt and become ready for breeding. A male grasps a female and deposits a packet of sperm on underside of her abdomen. The eggs are released by the female and fertilized as they pass over the sperm packet. The fertilized eggs (embryos) then stick to the hair-like structures on the female's pleopods (swimmerettes) of the female. Here the embryos develop over the winter, protected by the overhanging abdominal plates. When the embryos are ready to hatch the following spring, the female rests on the bottom and fans water under her abdomen to disperse the hatched larvae. Females may hatch up to 4,000 eggs, but the average is about half that. Growth of northern shrimp is relatively fast at first, and then slows as they get older. Females with eggs do not molt while carrying eggs. 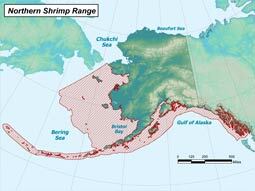 Northern shrimp may live for a maximum of at least 5 or 6 years in the Gulf of Alaska. Age is typically estimated based on modes, or clusters, in the distributions of length measurements. Unlike their heavy-bodied cousins the spot shrimp (P. platyceros) and coonstripe shrimp (P. hypsinotus), northern shrimp migrate into the water column each night to feed on small crustaceans and other zooplankton. When targeting plankton, northern shrimp filter feed, capturing their prey by trapping it among their legs. During the day however, they typically forage in the bottom sediments on worms, small crustaceans, algae, and detritus (dead organic matter). Several researchers have found that the abundance of northern shrimp is correlated with the organic content of bottom sediments. Fish species that prey upon northern shrimp include sablefish, arrowtooth flounder, Pacific cod, walleye pollock, rockfish, halibut, salmon, spiny dogfish, and many others. Northern shrimp are also consumed by common murres and other seabirds. Northern shrimp move up in the water column at night to feed, except that females carrying eggs remain near the bottom. There may also be some seasonal movements to shallower or deeper water. For example, egg-bearing females in some areas have been documented to move into shallower water when hatching larvae. Larvae may be distributed over larger areas by strong currents, but no large movements of adults have been documented. In the Pacific Ocean, northern shrimp are found from the Bering Sea south to Oregon in the east, and south to Japan and Korea in the west. Northern shrimp are also found in the north Atlantic, but these may be a separate species or subspecies. Northern shrimp are typically found over soft mud or silt bottoms in 50-100 m of water, but have been found at depths of up to 1,380 m (4,500 ft). They have been found in waters as warm as 12 °C (54 °F) but generally prefer waters in the range 3 to 6 °C (32 to 41 °F). Northern shrimp populations in the western and central Gulf of Alaska plummeted during the late 1970s and early 1980s. Although harvests were high and may not have been sustainable in some areas, declines in abundance in both fished and unfished areas suggest that fishing played a limited role in the population collapse. The decline was generally attributed to a climate regime shift beginning in 1977, which caused significant warming of Gulf of Alaska waters. Warming is believed to have direct effects on shrimp reproduction success and favors production of fishes that prey on shrimp. Northern shrimp abundance remains low over the western and central Gulf of Alaska, and the historically important trawl fisheries for northern shrimp remain closed. Recent trawl survey estimates in the Kodiak Archipelago and south of the Alaska Peninsula areas have been substantially below the thresholds for allowing harvest in nearly all areas surveyed. Trawl surveys in Kachemak Bay and along the outer Kenai Peninsula continue to show low abundance of northern shrimp. Status in the Bering Sea is unknown due to a lack of surveys, but abundance is believed to be low when compared to previous levels. In contrast, northern shrimp stocks in Southeast Alaska do not appear to have been affected by the regime shift. Following the decline in northern shrimp populations and in the shrimp market, the remaining trawl fisheries in the state began to target the larger sidestripe shrimp, Pandalopsis dispar. Available information indicates that surveyed stocks outside of Southeast Alaska remain at low abundance, with no evidence of significant improvement in the near future. The primary factors that can threaten northern shrimp populations are ocean regime shifts caused by climate cycles, ocean acidification, and overfishing. Regime shifts are changes in climate-ocean ecosystems from one relatively stable state to another, usually as the result of cyclic or periodic changes in climatic conditions. In the North Pacific, cool regimes tend to benefit shrimp, crabs, and forage fish, while warm regimes tend to benefit cod, pollock, halibut, salmon, and other fishes. Due to their narrow temperature tolerance, northern shrimp may be particularly sensitive to increases in ocean temperature. Ocean acidification is a potential threat to shrimp and many other invertebrates. The ocean absorbs carbon dioxide from the atmosphere. Carbon dioxide levels in the atmosphere are increasing from changes in land use and the burning of fossil fuels. As carbon dioxide builds up in the atmosphere, more is dissolved in seawater. This makes the ocean more acidic, which reduces the amount of calcium carbonate available for shell-building organisms such as shrimp, crabs, corals, etc. The effects of ocean acidification are projected to be larger and happen sooner at higher latitudes. Overfishing occurs when fishery removals exceed the production by the remaining stock. Although overfishing may have occurred in the past in some areas, northern shrimp are now taken mostly as bycatch in small amounts that are unlikely to result in overfishing. Total length to 15 cm, carapace length to 3 cm. From Japan and Korea in the western Pacific, north to the Bering Sea, then south to the Columbia River. Most mature as males in their second year, then permanently change to females in their fourth year. Caught primarily in beam and otter trawls, most are marketed peeled and frozen.